Container gardening and potting plants is far less daunting than it may seem to newbie gardeners! Many people choose container gardening because of its versatility, visual appeal and isolated maintenance routine. 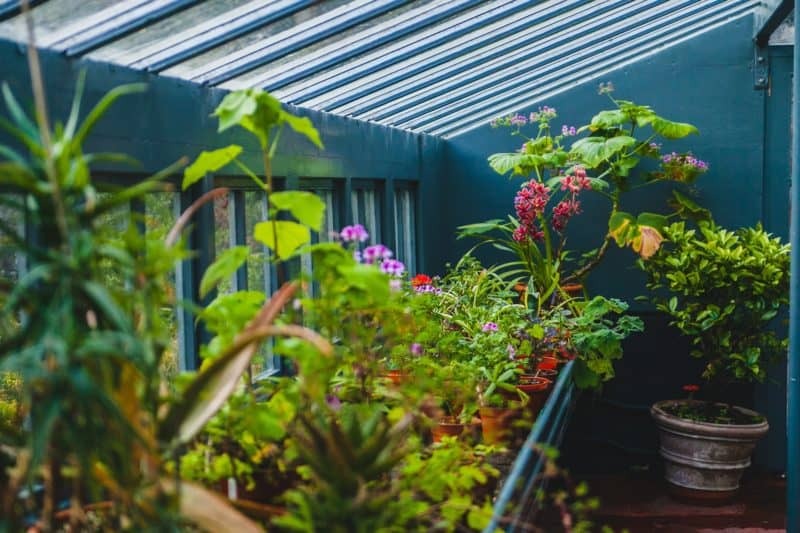 Especially for those living in flats or small apartments - boasting small garden spaces, patios or only balconies - container gardening is the perfect solution for adding life to your home and garden with ease. Choose your plant and your pot. 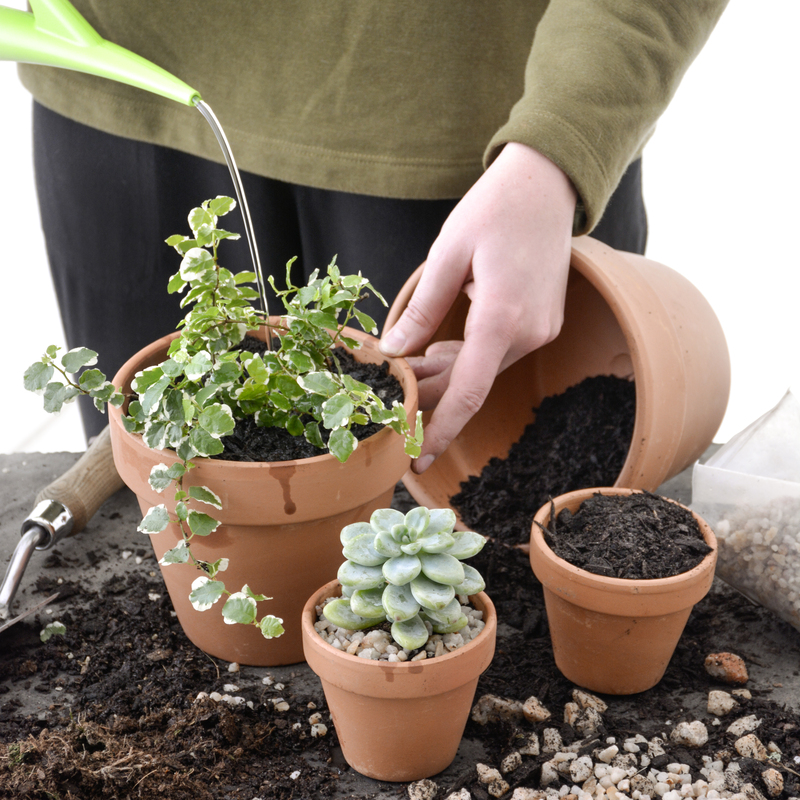 Ensure that the pot that you choose is slightly larger than the plant. The pot can be made of any material that you like (plastic, terracotta, glazed, concrete, etc. ), but it is imperative that it has drainage holes at the bottom. No matter the shape or size of your container/pot the same potting principles apply. Place small stones/pebbles at the base to cover the bottom of the pot, up to about 2cm high. These assist with water drainage and will keep your plant healthier for longer. Gently loosen the edges of your plant with a garden spade and pry the plant loose from its original pot, trying to keep all the roots intact. Place the plant into your new pot on top of the stones. 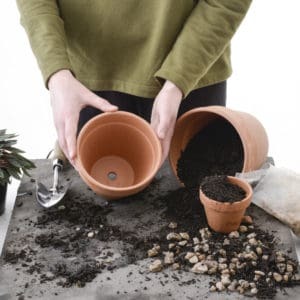 If the plant is smaller than the pot you may want to add some good quality potting soil on top of the stones before you place the plant into your new pot. 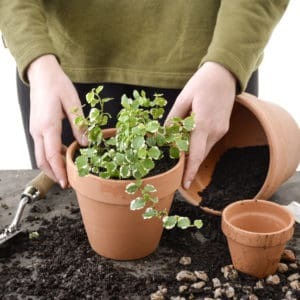 If the plant is higher than the rim of your pot, gently break away some of the roots from the bottom of the plant and then place it into your new pot. 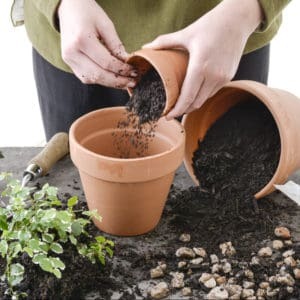 Once you have placed the plant into your new pot, press it down gently and cover with good quality potting soil until it is level with the rim of the pot or just lower than the rim. Press down firmly around the edges of the plant on the potting soil you have just added. It is important to ensure a compact environment for the roots within the soil. 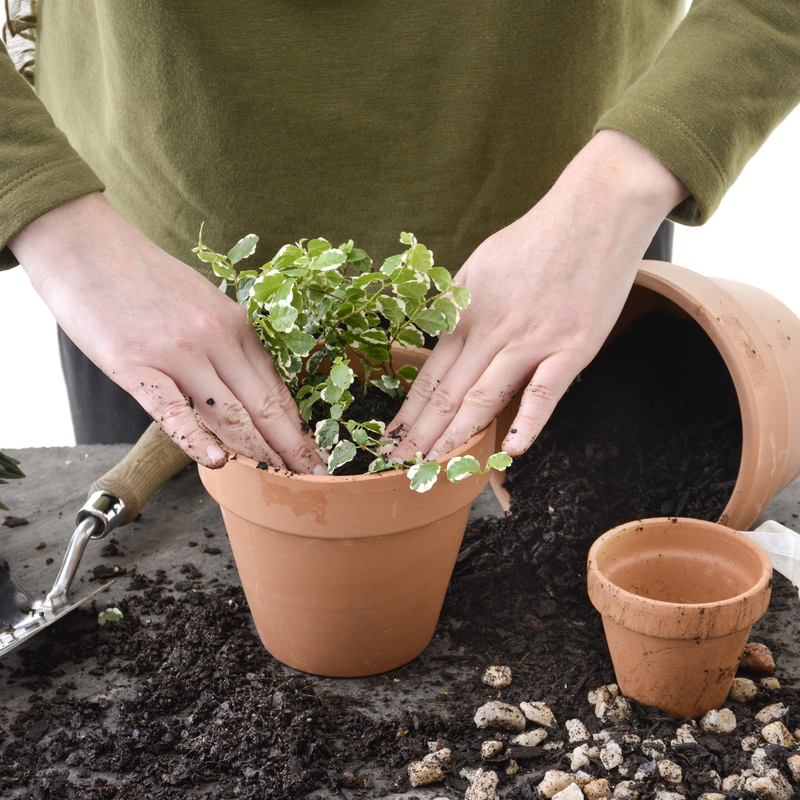 Just ensure that you don’t press down too hard - just firmly enough to ensure that the plant is stable and the roots are happy. Water your newly potted plant well. After all your work the plant might feel disturbed and needs some TLC to encourage it to establish well in its new environment. Thereafter, it is only necessary to water your plant when the soil feels dry to the touch. 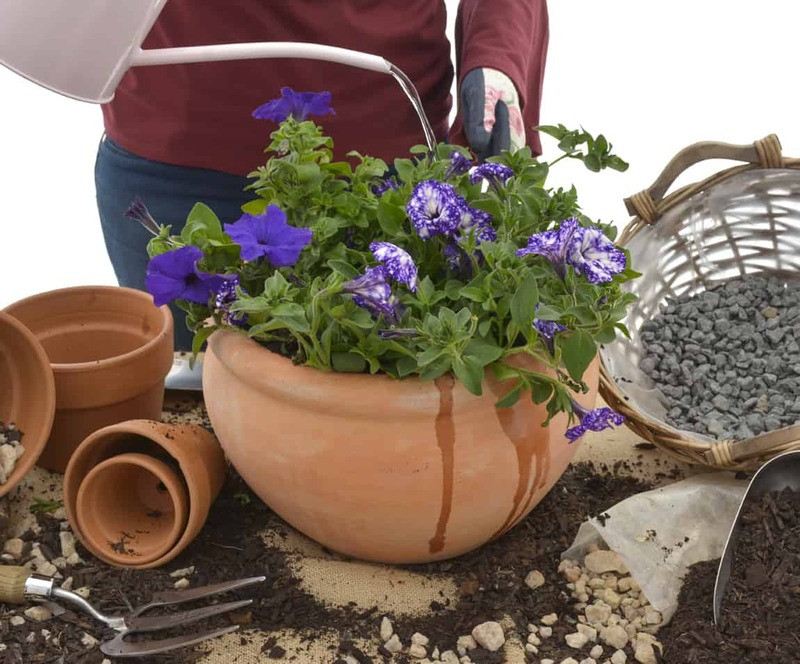 If you are unsure of best watering practices, the easiest way to know what your plant is telling you is to stick your finger into the soil and assess how moist it is. If it is dry, it is a good time to give it a watering. If the soil still feels moist, then it does not need to be watered just yet. You can click |HERE| to read our watering guidelines. Additionally, you can always lift your plants and start training yourself to understand whether it is heavy or it is light. Heavy indicates that it has enough water, light indicates that it needs to be watered. With more experience, knowing what your plants are asking for will become easier to see. So just keep going, keep testing and keep learning! Almost anything can be planted in containers and many plants actually thrive in this isolated and easy to maintain environment. Container gardening, allows you to give each type of plant the care it specifically needs. Watering needs, sunshine exposure and fertilising can all be controlled. 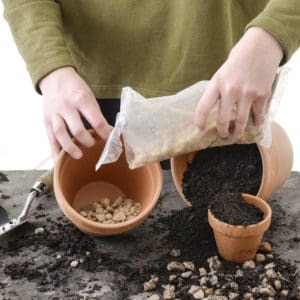 From seeds (flowers, herbs and vegetable), to herbs and veggies, to roses, fruit tress, standards of all kinds (bougainvilleas, azaleas, camellias, fuschias and more), perennials (lavender, osteospermum, clivias, strelitzias, geraniums, pelargoniums, to name a few) and even seedlings can be planted in containers with success. 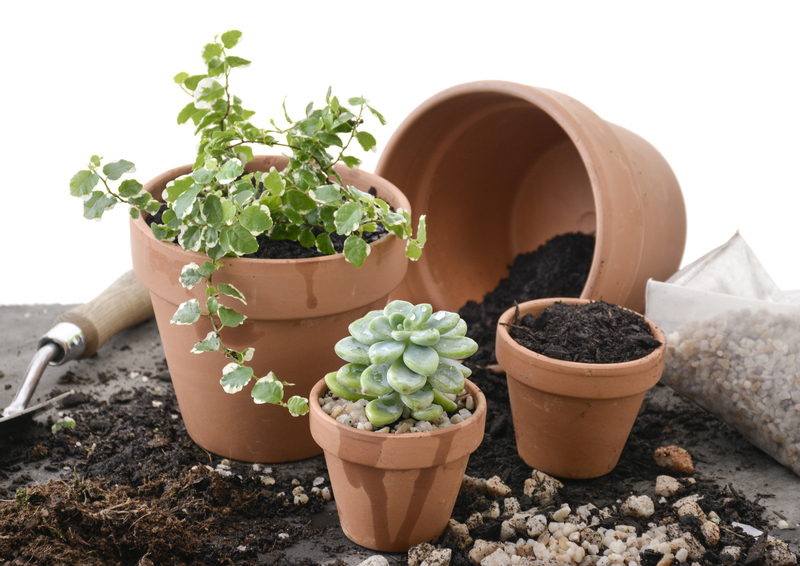 Download your printable version of our guide to potting plants |HERE|! Additionally, we have put together a wonderful step by step planting guide inspired by the Pantone colour of the year 2018 - Ultraviolet.